Michael Fremer Rated 10/10 Music, 10/10 Sonics! - Winner of a Gruvy Award, chosen by AnalogPlanet's editor, Michael Fremer, for vinyl records that are musically and sonically outstanding and are also well mastered and pressed. It’s the album the ignited sea changes in pop culture, music, songwriting, poetry, and the social consciousness. It’s the creation of a 22-year-old visionary still years away from casting a jaundiced eye to the media. It’s the sound of change, the feeling of ground shifting beneath one’s feet, and the entrance of an entirely new way of thinking. It’s the effective beginning of what’s arguably the boldest career in music history, the yawning vortex into the complex mind, supernatural wordplay, and folk techniques of a vocalist/guitarist whose name is forever associated with transformation. It’s The Freewheelin’ Bob Dylan. As part of its Bob Dylan catalog restoration series, Mobile Fidelity is thoroughly humbled to have the privilege of mastering the iconic LP from the original master tapes and pressing it on 45RPM LPs at RTI. 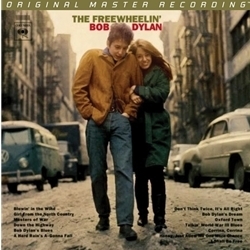 The end result is the very finest, most transparent analog edition of The Freewheelin’ Bob Dylan ever produced. Never before has the resonance of his nylon guitar strings, fingerpicked notes, shivering harmonica fills, or plainspoken timbre possessed such clarity, openness, body, or realism. With the advantage of wider and deeper grooves, the 45RPM pressing affords the opportunity to detect more information and lavish in extra richness. Whether it’s the exaggerated nasal accents employed on “Down the Highway” or the decay of each strummed line on the entirely acoustic album, previously concealed details, microdynamics, and ambient cues surface—enhancing the listeners’ experience and taking them inside Columbia’s Studio A where history was made by leaps and bounds. Exponentially surpassing the potential he demonstrated on his debut, Dylan became a mirror of the concerns, issues, and feelings confronting the nation. Writing and singing with penetrating honesty, observational wit, moral conviction, and scathing emotion, he digs into the madness of war (“Masters of War,” “A Hard Rain’s A-Gonna Fall”), hypocrisy of segregation (“Oxford Town”), urgency of civil rights and freedom (“Blowin’ in the Wind”), and multiple angles of unrequited love (“Girl From the North Country,” “Don’t Think Twice It’s All Right”) with a literate astuteness and depth that, nearly 50 years later, still leave audiences slack-jawed. Satire, absurdist humor, and traditional blues also pepper the album, which rests upon graceful melodies and sparse, poignant patterns. Viewed as protest songs, love songs, folk songs, or talking blues songs, the material on The Freewheelin’ Bob Dylanremains amongst the most astonishing and imaginative ever committed to tape. It deserves—as much as you deserve—a fidelity that makes as closely intimate as possible the music’s connection with you. You deserve this edition.